The use of poison arrows by HBP is open to dispute, since we don't know enough yet about the possible spread of this technology with the Bantu expansion, and we also don't know whether or not there are significant differences in the design of such devices among the various Pygmy and Bushmen groups, which might suggest independent invention. We have been able, nevertheless, to posit a very reasonable, interesting and, in fact, eminently testable (i.e., falsifiable) hypothesis, based on evidence made available via our triangulation methodology, thus demonstrating its usefullness. The poverty of the Bushman existence is very clearly indicated by their huts. It is the women's task to erect them. At a distance of from six to eight feet apart, two strong poles are planted in the ground in such a way that the points meet at the height of about five feet. The tops are tied together with the soft bark of a tree. This archway forms the door to the Bushman hut and it is never closed. Further poles are now planted in an irregular semicircle and joined at the top to form a sort of domed roof. This framework is covered with branches with leaves on and dry grass, and the Bushman hut is complete (p. 17 -- my emphasis). Now she squatted down making her own home, driving the saplings into the ground with deep thrusts, each time in exactly the same place, so that they went deeper and deeper. When she had completed a circle she stood up and deftly bent the fito over her head, twisting them together and twining smaller saplings across, forming a lattice framework. Then she took the leaves we had collected and slit the stalks toward the end, like clothespins, hooking two or three of them together. When she had enough she started hanging them on the framework like tiles, overlapping each other and forming a waterproof covering (pp 64-65 -- my emphasis). Since the Twa and Mbuti are EP, and the Baka are WP, both photos and written descriptions represent all three groups, EP, WP and Bu. Since there are so many striking similarities in the way these huts look, the way they are constructed, and also the cultural context of their construction, i.e., in almost all cases constructed as temporary shelters, in hunting camps, and by women, it would seem very difficult to argue that they could have been independently developed. And since the three groups appear to have lived in completely different regions of Africa, with no possible means of contact, and no evidence of contact (remember that their genetic profiles are completely different), the only remaining explanation would be on the basis of shared ancestry, stemming from the use of similar huts by HBP. Unlike poison arrows, which are found among at least some Bantu groups, this particular hut design is not found among Bantus. And for a very good reason -- Bantu tribes live in sedentary settlements and thus require more permanent dwellings. It is thus highly unlikely that this type of hut design was the result of Bantu influence. Independent invention is a particularly weak alternative in this case since most instances of independent invention are driven by environmental adaptation, and, as I've already demonstrated, Pygmies and Bushmen live in two totally different environments, tropical forest and desert. Finally, I'm going to invoke Occam's Razor, a well known though little understood scientific principle that goes like this: "pluralitas non est ponenda sine necessitate ("plurality should not be posited without necessity")." In other words, if there is no necessary reason to do so, it is better not to assume that any particular phenomenon (such as the striking similarities among EP, WP and Bu huts) has a plurality of causes (i.e., independent inventions), when a simpler explanation (shared heritage) fits the evidence equally well. In this case, as should be clear, the simpler explanation fits the evidence far better than independent invention, or indeed any other explanation I can think of. Putting together all of the above, I would say that it is possible, on the basis of evidence gleaned via triangulation, to make an unusually convincing case that this type of "beehive" hut was indeed a part of HBC, and that, to this extent at least, we have conjured HBP. I agree. Seems a very reasonable HBP trait. This is a particularly odd example. Huts like that are found among hundreds of hunter-gatherer groups around the world. Such shared traits as "built by women" and "waterproof" that you think make them unique to Bushmen and Pygmies are also widely found around the world. The reason why you don't find them among the Bantu is because Bantu, as you're aware, are agriculturalists. The type of dwelling you attribute to HBC is the function of a forager lifestyle. This is the simplest explanation possible. Dwellings like this must have existed 40K years ago, no doubt about that. There's no doubt that the earliest humans were foragers, rather than industrialists. The exact form, materials and style of the earliest human dwellings can only be recovered by archaeology, if it can be of any help here due to the perishability of these artifacts. (But comp. Dillehay reconstructed a similar dwelling at Monte Verde in Chile at 13,000 YBP.) But why do you need to clout this rather banal idea in the scientific jargon such as HBC and Occam's Razor? You've violated the principle of Occam's Razor by inventing a problem where it doesn't exist. Out of Africa artificially singled out Bushmen and Pygmies as the earliest human offshoots. This leads comparative ethnology into a blind alley. There're not too many foraging groups in Africa, and sure like foragers everywhere else, they happen to live in huts or similar temporary dwellings. The diversity of foraging lifestyles outside of Africa, especially in America, is much greater. You can find much more data for comparative ethnoarchitectural studies outside of Africa. Just not to throw a wet blanket on you, here's an article on the use of ethnographic analogies in archaeology (Cross-Cultural Approaches in Archaeology: Comparative Ethnology, Comparative Archaeology, and Archaeoethnology, By Peter Peregrine). http://www.springerlink.com/content/n2731r39pk222023/. If you manage to use your readings on Pygmies and Bushmen material culture to illustrate some of the points Peregrine is making, I'd be interested in reading your next post. I can e-mail you the article. German: "This is a particularly odd example. 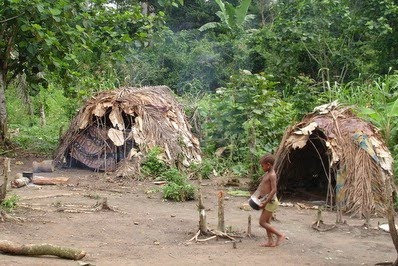 Huts like that are found among hundreds of hunter-gatherer groups around the world." You're making exactly the same assumption you made in an earlier comment. I am well aware that similar huts are found among other hunter-gatherers worldwide. But that has no bearing on what I'm doing here. If the pygmies and bushmen were the only ones to use such huts, then they would be far less interesting than they are. Once we establish our baseline, we can then go on to consider whether or not all the other foraging groups are more likely to have independently invented this design or inherited it from HBC. I won't pursue this now because I don't want to get ahead of myself. "The type of dwelling you attribute to HBC is the function of a forager lifestyle. This is the simplest explanation possible." This is an assumption. And it is in clear violation of Occam's Razor, which states: "plurality should not be posited without necessity." You are assuming a large plurality of independent inventions as opposed to a single invention passed down over the generations from a single source: HBC. As I've already stated, there are far too many assumptions in anthropology, which is why comparative studies has become so suspect. It is my intention to avoid making assumptions, but work only from evidence. If you want to argue that EP, WP and Bu use such huts solely as a "function of their forager lifestyle," you are free to do so, and I'll be interested in seeing what evidence you can muster to support your hypothesis. As for the other foraging groups, I intend to consider them as well, but only after HBC has been established, based on evidence, not conjecture. German, I am very interested in reading this article, so please email it to me, by all means. And thank you for calling to my attention. 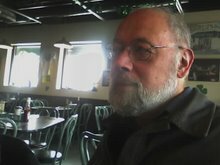 I am well aware of "ethnographic analogy" as a technique, but since such analogies are almost always based on assumptions, I doubt that this article can be applied to what I am attempting here, which is in any case totally different from any other approach I've ever seen or heard of. Nevertheless, I'm very much interested in reading it and having the opportunity to respond. "But that has no bearing on what I'm doing here. If the pygmies and bushmen were the only ones to use such huts, then they would be far less interesting than they are." Why? I think it would make your claim that Pygmies and Bushmen share a common ancestor much more believable. "This is an assumption. And it is in clear violation of Occam's Razor, which states: "plurality should not be posited without necessity." You are assuming a large plurality of independent inventions as opposed to a single invention passed down over the generations from a single source: HBC." We have radically different understandings of what an "assumption" is and what "Occam's Razor" is. You assume that similarities between Pygmy and Bushmen huts mean common descent. I think that they are just similar, like so many other forager dwellings worldwide. I don't assign any additional phylogenetic meaning to these similarities. This is Occam's Razor, in my opinion. And it's good cladistics. DocG: "If the pygmies and bushmen were the only ones to use such huts, then they would be far less interesting than they are." German: "Why? I think it would make your claim that Pygmies and Bushmen share a common ancestor much more believable." It surprises me that someone who's been following this blog for so long still has so little understanding of what I'm attempting here. There is a reason for establishing a baseline that you don't appear to see. I'm not trying to establish that they have a common ancestor because as far as I'm concerned there is already more than enough evidence, both genetic and musical, to support that hypothesis. I'm trying to use their common ancestry as a baseline for the study of cultural history generally. I haven't yet arrived at that stage of my presentation, but it will be coming soon, I assure you. German: "You assume that similarities between Pygmy and Bushmen huts mean common descent. I think that they are just similar, like so many other forager dwellings worldwide." I'm astonished that someone who claims to accept the notion of a common ancestry for all modern humans (as oppossed to the Multiregional model), and bases his own theory on worldwide similarities in kinship terminology, could have a problem with what I'm doing so far as music, huts, etc. is concerned. I know we don't agree on OOA vs. OOAm, but you should at least understand the basic idea behind constructing an ancestral baseline. 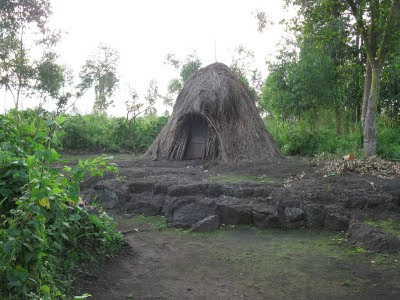 If, as the genetic and musical evidence strongly suggest, the Pygmies and Bushmen had a common ancestor, and that ancestor built essentially the same type of beehive huts, then unquestionably the simplest explanation for the huts now used would be that they are part of the cultural legacy of the ancestral group. The alternative would be to assume that somehow the tradition of making those huts was lost and then regained at some later period IN ALL THREE REGIONS. Doesn't that strike you as just a little improbable? And if you want to argue that the common ancestors were more likely to have built some other type of dwelling or had none at all, then how do you explain the tremendous coincidence that pygmies and bushmen IN ALL THREE REGIONS managed to come up with more or less exactly the same design? If you want to argue that the design is simply a functional adaptation to hunting and gathering conditions, then my response is that this "explantion" is superfluous. If it is the only option for hunter-gatherers then it would have been the only option for the ancestral group as well. And if you find the exact same design 100 years later, among the descendents of this group, it seems clear that it's being used because it's a tradition handed down from the ancestral group, NOT simply because of some theory of functionality. And if that's true for the first 100 years it will be true for the next 100 years and so on down the line for thousands of years, why not? The functionality, meaningful or not, becomes superfluous, just as the luminiferous ether became superflous after Einstein's relativity was accepted. Due to Occam's razor, I might add. "If, as the genetic and musical evidence strongly suggest, the Pygmies and Bushmen had a common ancestor, and that ancestor built essentially the same type of beehive huts, then unquestionably the simplest explanation for the huts now used would be that they are part of the cultural legacy of the ancestral group. The alternative would be to assume that somehow the tradition of making those huts was lost and then regained at some later period IN ALL THREE REGIONS. Doesn't that strike you as just a little improbable?" They may have originally lived in caves and then arrived at similar types of dwellings independently as they moved into the areas without caves. Victor, you're trying to force your "common descent" argument onto the data that absolutely doesn't require it. If I were you I would study comparative linguistics for the methodology of historical reconstructions. It distinguishes common descent, borrowing, and convergence as equally parsimonious ways of accounting for facts. This will help you with your musical evidence as well because I have a feeling that you assume common descent in all situations of observable similarities without developing strong synchronic models and typologies in order to identify what is inherited, what is borrowed and what constitutes general structural properties. It surprises me that someone who's been following this blog for so long still has so little understanding of what I'm attempting here. He doesn't want to understand. Just to propagate his hypothesis in the vain hope of persuading someone else. I have discussed with him enough to know. He will reason circularly until you just give up, then he'll come back with some apparent conciliatory approach only to re-start the cycle. German: "Victor, you're trying to force your "common descent" argument onto the data that absolutely doesn't require it." I am NOT trying to force anything or prove anything. I'm trying to open channels for a fresh approach to the study of deep history by zeroing in on very specific hypotheses that seem likely and can be subject to further testing. "Our method will be simple. Any attribute found to be shared by at least one group in each of the three populations with the deepest clades, i.e., Eastern Pygmies, Western Pygmies and Bushmen (EP, WP, Bu), should be taken seriously as a possible survival from the time the ancestors of all three groups were united as one -- the group I'm calling HBP." Note the words "taken seriously" -- in other words, a likely hypothesis open to further testing, not a proven fact. German: "It distinguishes common descent, borrowing, and convergence as equally parsimonious ways of accounting for facts." First of all, common descent will always be a more parsimonious explanation than the other two. However, it may not fit the evidence as well, so it is certainly not the only option. Secondly, I HAVE been making exactly the same distinctions and evaluating my hypotheses on exactly that basis. "I have a feeling that you assume common descent in all situations of observable similarities"
If you read more carefully in this blog and in my papers you will see that this is not the case. I consider differences as well as similarities. This is one of the reasons why Cantometrics has been so useful to me because it has enabled me to quickly check for both similarities and differences on a worldwide basis. See my paper on the Kalahari debate for a very clear example. German: "They may have originally lived in caves and then arrived at similar types of dwellings independently as they moved into the areas without caves." Interesting hypothesis. Good. Let's test it. First of all, what evidence is there there that they lived on a day to day basis in caves? or could have lived on a regular basis in caves? Are you assuming they were sedentary? If they were nomads, as is generally believed, they would not have remained in one place for very long, so you are assuming they would have moved from cave to cave? While there is evidence of human habitation in certain caves during the Paleolithic, that doesn't mean they lived in caves all their lives and in fact the word "cavemen" is more of a stereotype than a historical fact. They may have taken shelter in caves from time to time but we have no reason to believe that these were permanent dwellings. You are assuming, moreover, that the beehive hut is the only logical or most logical type of dwelling for foragers to construct. What is the evidence for that? When I was a boy scout I learned how easy it is to construct a lean-to, much easier than a beehive hut. This is apparently the sort of shelter used by the Nambikwara, who are also reported to have simply slept on the ground under palm trees. I see nothing about the forager way of life that requires the use of beehive huts, sorry. While these huts are simple they are not THAT simple. They require preparation of the ground ahead of time, they are carefully planned, and they are beautifully dome-shaped. Quite an achievement for a "cave man." There's nothing particularly primitive about cave dwellings. Dogons have them, ancient Anasazi had them, and of course Cro-Magnons had them. Not to mention a modern family in Arizona that built a house in a cave. This is just an example of the typological diversity of dwellings found in historic and prehistoric tribal populations. It's intended to illustrate my point that two similar types of dwellings could evolve independently from a third, utterly dissimilar, dwelling. And no "Occam's Razor" can prevent me from considering this possibility, especially since cave dwellings are attested archaeologically, while beehive huts (as far as I know) aren't. "You are assuming, moreover, that the beehive hut is the only logical or most logical type of dwelling for foragers to construct." I don't assume anything. But I know that beehive huts have worldwide presence (Caddo Indians in North America had them) and they are made of both perishable and stone materials. Once again, without a cross-cultural, archaeoethnological typology of dwellings, the seasonality of use and the social structure underlying them, I can't accept your reconstructions. Thinking about dwellings as "function of forager lifestyle" may be too simplistic, especially since there's quite a bit of diversity among foragers and among their dwellings but at least it's less pretentious and restrictive than an assumption of "common descent." Once you lock yourself into the "common descent" idea, you close your eyes to the vicissitudes of history. Victor, German is BSing, and knows it. You got it right.